A view from the cycle path: Snow. What tyres to make it safe ? Good idea to do only the front tyre. Only last week I took my son's bike to the bike shop. A new rear tyre had to be fitted, but these modern bikes are made so damn complicated that I could fix it myself anymore, and the gear hub was so intricate that I couldn't adjust it without a special tool either. I used to be able to do it myself on my older bikes. Just the front tyre shouldn't be any problem, though. 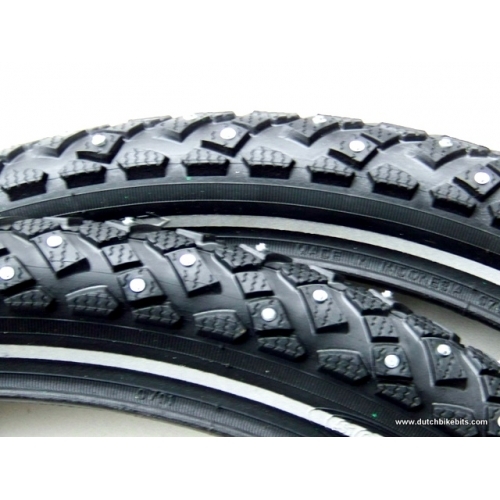 I've cycled through winter with and without studded tyres and I think the best safety device is to take your time. When the conditions warrant studded tyres, they can be very convenient. As is often explained on this blog, the feeling of safety is a very important issue to cycling. It's also easy to overestimate the protective effect of gear and infrastructure. It's not the snow or even the infrastructure that makes it unsafe, it's the people using it. I find that a very empowering thought. Hope everyone gets a winter with lots of snow! due to my own mistake, I have been forced to cycle my 2 wheeler, and while I do take it slow and safe, I did slip the other day, such that I once again bended my handlebar :-( If I need to ride my 2 wheeled bike for much longer, I will buy a studded tire. This winter is my first on a citybike in Yekaterinburg, Russia and I chose this exact model - Schwalbe Marathon Winter. I was a bit concerned since I saw several reviews where folks said that studs tend to come off these tyres. But so far so good - no lost studs for 1,5 months. I put them on both wheels and they hold very well both on ice and compacted snow, almost as good as Nokian Extreme which I had previously on MTB. I lost studs on the rear wheel of my Mango velomobile. I do also have studded tires on the front wheels because I want to be able to brake and turn well. I plan to buy such a tyre, just in case of a winter with "bad" weather. Around here, it rarely snows. Yet, on these occasions, I do want to keep on using my bike. However I find it not very practical to have to swap for a specific tyre. Prefitting a spare wheel with a winter tyre is not really an option either : my front wheel is equipped with a hub dynamo and roller break. I've just discovered a interesting product, designed by a Dutchman. It's basically an add-on, which avoids have to swap the whole tire. I understand that it is only a prototype but I'd love to have a pair of them for my bicycle ! Colibri: It only takes five minutes to swap tyres. Two of the bikes I've done this week (Judy's above and my own) have roller brakes. You loosen the tyre, undo the wheel nuts and then the tyre can be taken off the wheel and swapped without having to touch the cable. No problem. Call me old-fashioned and boring, but I'm still more impressed with good products which work as they're supposed to, from an established manufacturer, and which are available right now than I am in the latest "designer" hype. There are several obvious drawbacks to that idea, including added unpleasantness should you get a puncture, the inability to use it with a bottle dynamo, and who knows what the failure mode of such a contraption is ? Perhaps it can come loose and block the front wheel so that you go for a trip over the handlebars. I wouldn't want to be the first to find this out. Of course, it may also end up being really good, and it may even end up taking less time to fit than the five minutes that it takes to swap a tyre. However, that's all rather academic when you can't buy it. I bought a mountain bike as my dedicated winter bike last year and fitted it with a front wheel Marathon Winter studded tyre. Unfortuneatly ;-) it was a winter with only little snow and ice. Now I rode the first trips with snow and ice again and it feels very safe. Rim brakes are not very good in deep snow and icing conditions. And same with the bottle dynamo. Ice and snow on the rims makes them rather useless. I remember making DIY snow chains of steel wire and baling wire for my bike when I was a kid. I guess they didn't work very well, because I stopped using them. I rode with regular tyres for decades, until I bought a studded tyre last year. Actually you can get by most of the winter with regular tyres if the bikeways are gritted and/or there isn't lots of daily thaw-freeze going on. Not that studded tyres are useless even then, but on days with black ice or glass smooth ice the studded tyres really work their worth. You can ride with them on asphalt, too, so you don't have to switch them on and off every morning.